A hop-on-hop-off tour of Titanic Quarter. Experience the story of the shipyard...get close to giants...and rest yer wee legs! In 1912, Titanic's builders were transported to and from the shipyard by frequent, pollution-free, electrically-powered trams. 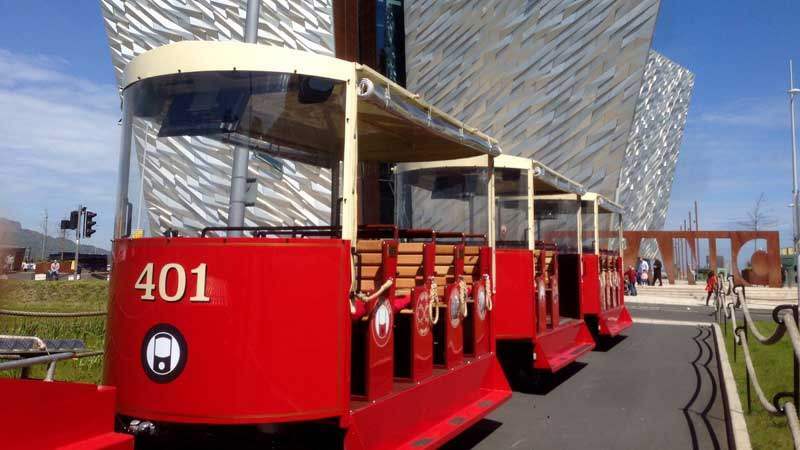 And now, in the emerging and inspiring surroundings of Titanic Quarter, the tram is back! Wee Tram passengers travel in carriages purpose-built to echo the outlines, proportions and colour schemes of the 1912 tram cars - and just like the originals, electricity provides the motive power. Passengers can even echo the past themselves by wearing their very own Edwardian 'duncher' (the yardman's flat cap)! For further information please the Wee Tram website.